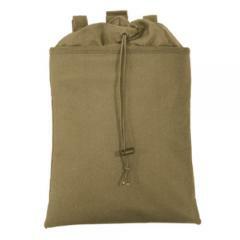 have many tactical pouches to choose from. The handy Roll-Up Dump Pouch from Voodoo Tactical is the perfect way to carry loose ammunition, spent magazines and other miscellaneous shooting items when spending a day practicing in the field or at the range. Constructed from rugged pack cloth, it is durable enough to withstand the demands of law enforcement or outdoor recreational use. When not in use, it can be rolled up for convenient storage without taking up space. The universal straps attach easily to a pack, belt or webbing system for ultimate compatibility with a wide-range of gear. The inner compartment is secured by an extended drawstring collar, offering a wide-opening for rummaging through contents while guaranteeing retention. A pair of draining grommets allow liquids to exit the Dump Pouch instead of building up and potentially damaging items. Works as intended and is made of quality materials. However, I do wish that I would have gotten the largest pouch offered in order to better store multiple M4 and pistol magazines. Other than that its a great piece of equipment and I would highly recommend it to shooters doing moving and shooting with tactical reloads so you're not fumbling to put magazines back in your kit.